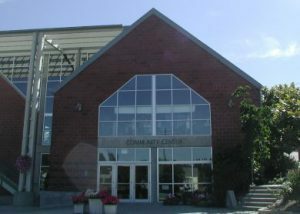 The community center, both inside and out, is the center of Issaquah’s Parks and Recreation activities. Some of the inside amenities include a computer lab, fitness area, running track, sports courts, and youth center. The expansive front lawn is the home of frequent summer music concerts, and the City puts together outdoor programs such as “Beat the Heat” splash days and chalk art festivals. Inside, the community center has a lot of flexible open space. 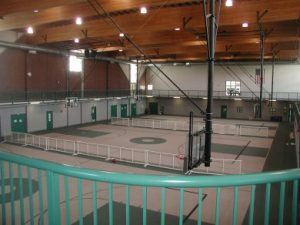 The bulk of the building is filled with three multi-purpose sports courts. A visitor on a typical day may see basketball players in one court, an aerobics class in another, and toddlers playing with large toys in the other. The dividers can be removed for large events, such as the annual Kiwanis auction. The courts are ringed with a second floor running track – the walls of which are lined with historic photos of Issaquah. Issaquah Community Center, interior. (Photo courtesy of David Bangs, 2000). 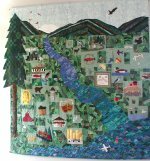 A brightly colored quilt hanging in the front lobby of the Community Center depicts prominent elements of the town, including the Depot, State Salmon Hatchery, Issaquah Creek, the Village Theatre, and the Darigold Creamery. The quilt was made by the Issaquah Quilters, and took more than two years to complete. Construction of the community center began in 1995, and was completed in 1997. The design of the building was inspired by a number of historical photographs. Of particular interest to the planning committee were photos of old mining facilities, the railroad depot, and the original Issaquah school house building. 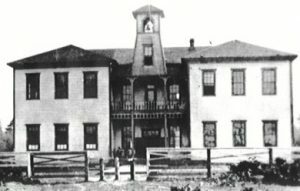 The old wood frame school house (1889-1915) was originally located behind and above the new community center building, at the current site of Issaquah Middle School. It’s double tower symmetrical design was apparently an inspiration to the designers of the community center. This wood frame school house (1889-1915) was located behind and above the new community center building, at the current site of Issaquah Middle School. It’s double tower symmetrical design was apparently an inspiration to the designers of the community center.